The area was once an industrial area and busy commercial dockside serving the area, while the Newcastle side also hosted a regular street market. In recent years as the docks became run-down, and the area has since been heavily redeveloped to provide a modern environment for the modern arts, music and culture, as well as new housing developments. The NewcastleGateshead initiative now lists the Quayside as a top ten attraction. 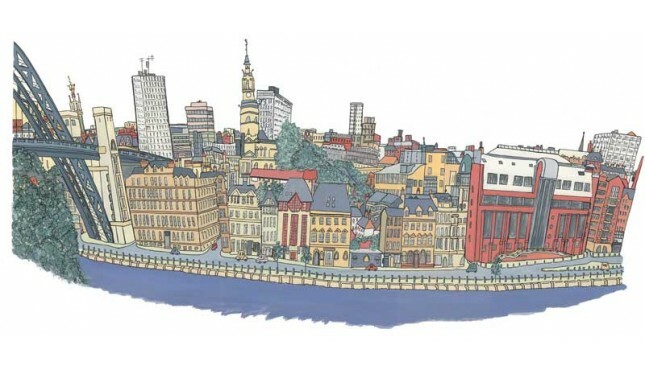 Locan artists and Photographers have contibuted to what we believe is the biggest on line range of Pictures and prints of Newcastle Quayside. The Gateshead side of the river is designated and sign-posted as Gateshead Quays. It is the site of the BALTIC Centre for Contemporary Art and The Sage performing arts and conference centre. One of the Quayside's main features is the pedestrian Gateshead Millennium Bridge, opened in 2001, which spans the river between the BALTIC Centre for Contemporary Art and the Newcastle Law Courts. The other bridge which allows direct road and pedestrian links between the two banks is the low level Swing Bridge, built in 1876, and located nearer the two respective city centres. Using the two bridges, the Quayside is the venue for the junior course of the annual Great North Run.